Are you grappling with grammar? Are you perplexed by punctuation? Do you find it a constant challenge to keep your pupils engaged while teaching grammar effectively? 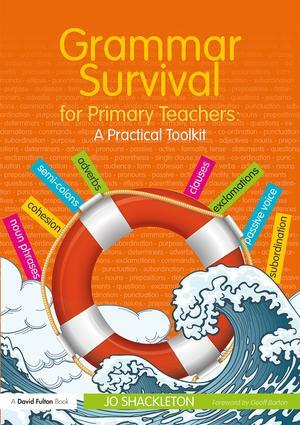 Focusing on what you need to know in the classroom, Grammar Survival for Primary Teachers provides you with all of the knowledge and practical advice you’ll need to teach grammar and punctuation effectively. Based on a successful, tried-and-tested format, this new book is designed especially for primary teachers and focuses on the requirements of the English National Curriculum for Key Stages 1 and 2.
a strong focus on building knowledge and applying it to writing. Accessible and engaging, this new book will be essential reading for busy trainee, newly qualified and practising teachers alike. It is the perfect guide for those looking to improve both their pupils’ and their own understanding of grammar.